Josh Hubble from Faith Family Church in Victoria,TX brings us this hopeful Christmas design. 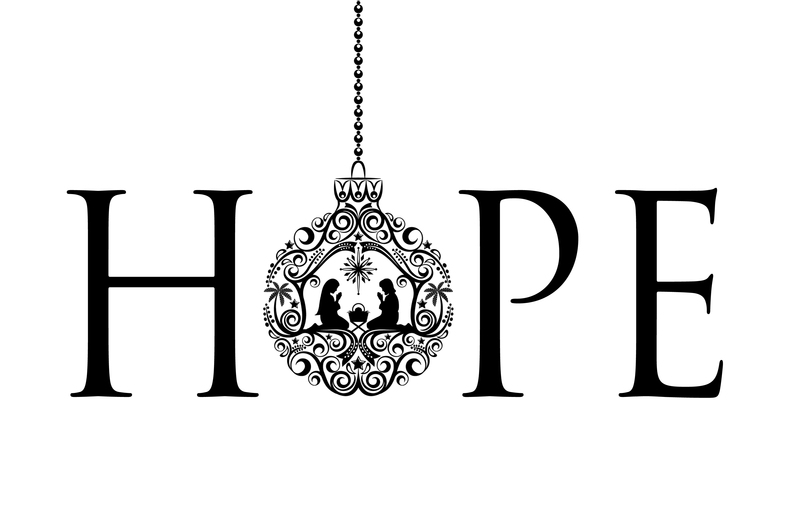 Last Christmas, their graphic artist came up with an ornament that replaced the “O” in Hope for their Christmas series. That was the inspiration for this set. They have made the transition to more generic sets that can stay up longer than the length of one series to better respect the time of their volunteers, but this was one occasion they decided to give the simplicity and elegance of the art the focus it deserved. Josh took to Sketchup to recreate the ornament by importing the art and tracing it. Once it was traced, he built the rest of the word, so they had a good idea of what the scale needed to be. They ordered a block of compressed foam that was about 4’x6’x9″ for the ornament and I made a black and white transparency for the carpenter. He traced, routed, and gold-leafed the ornament. Then he cut the letters from luan. The hardest part was finding the center of gravity for the word Hope as they were hanging it. They painted a plastic chain gold to match the ornament and tied it off in the ceiling so the ornament appeared to be hanging. Behind the set were 6 Chauvet Sparklite LED curtains to create the star field. Impressive use of gold leaf! Love it! Thanks… Our carpenter really out did our expectations. wondering where you bought your lights… we are looking to purchase a large quantity of stringed or net twinkle lights….. They are actually a LED curtain by Chauvet called SparkliteLED. That curtain is 6 panels put together. Unfortunately we don’t have close to that for budget this Christmas to purchase. Hoping to rent. Also, did you some how double up your drapes by “stacking” them, or is that the actual distributed pattern of the LEDs? They have Velcro on the edges. We hanged the 3 wide and 2 tall. The led’s are in a fixed pattern and the solid curtain. It’s a great investment, at a fraction of the cost of fiber. where did you buy the compressed foam sheets? Your design is beautiful! Thank You… Our fine arts director purchased the Foam from a company near San Antonio, to the best of my knowledge. However there are compressed foam suppliers all over the us. We bought a block that was about 9″ thick for the Ornament. is the compressed foam soft or hard? For the ornament or was that something you designed? This is a worshipful set – hard to come by. I love funky designs but this is engaging! Would you happen to have the art work so we could hang this for our first Church run of Christmas Carols for the local community here in Jesmond? Is it ok to use this design? Josh, This is by far the most beautiful display I have ever seen. I would love to do this for Humble Area First Baptist. Do you sell the art work? If so please let me know. This is so beautiful, I’m so impressed. Is it possible to get the artwork for the ornament? We are doing an outdoor desert theme of the manger this year. The ornament seems perfect. Thanks so much for any information :) Blessings! This is so beautiful. Would love to do something like this for our Christmas. Again as previously asked by many, do you sell the art work or can a model similar to your idea be used? I can send the art to you and am happy to help. Email me at jhubble@hubbleprod.com. Josh, You did a stellar job on this set. It is absolutely stunning. I’m in charge of decorating for my church and I’d love to do this if I could get the graphics from you. I just know the congregation would absolutely fall in love with it!! Thanks so much for all you do!! Beautiful work! Would love to use at our church this Christmas (with your permission). Email sent 11/4. This design is available in the silhouette cameo design store. If you don’t have the software, you wont be able to download it. I have saved it in pdf form if you would like I can send it to you. Will you be able to send me the design for our church christmas stage decor. I was searching for ideas for our church here in Southern California and found your churches Christmas stage decoration, which I loved. I read the comments. Would I also be able to get a copy of the design for the for the letter O on the word hope please? Jo Ann, could you please send me the PDF? I don’t know if this a long shot but I was hoping to be able to get a copy of the ornament design if you still have it. I would love to have the PDF form! Thank you so much! Hey Everyone… Here is the link to the Art we used.